Thomas Lubari has been involved in church development and planting in Sudan based out of Jinja in Uganda. He leads a church in Jinja and makes frequent visits to the Sudan. He is very passionate and despite a lot of financial constraints, is working very hard. He has a number of other projects in development in Sudan including literacy, training and agriculture. In 2006 the Bright Hope Africa Director first met Thomas. They had been communicating by e-mail for more than a year. 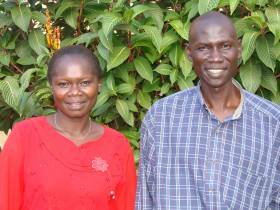 In 2006 they met in Jinja and heard the story of Thomas and Joyce. Thomas and Joyce are both refugees from Sudan and have been living in Uganda since fleeing the war in Sudan in 1990. While living in Uganda they have gone to school and done well. Both have been trained in both the employment sector and at Bible school. They have five children of their own but also care for three other children who have either been neglected by their parents or are orphans. They initially planted a church in the west Nile town of Koboka which borders south Sudan and the DCR. However rebel insurgency hit Koboka and they fled to Jinja where they planted the church there in February 1996. They continue to lead this local church in Jinja but their hearts are in New Sudan and Thomas frequently returns there to assist the development of the country and the church. Soon after the meeting in 2006 BHW began supporting them as a family with the idea of increasing support of the ministry as we got to know them better. 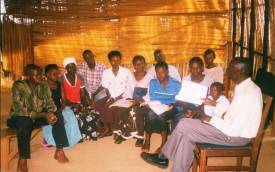 BHW staff met them again in 2007 in their home in Jinja and we continue to be impressed by their energy and hard work. Currently Thomas is involved full time in the ministry of the Lord - both training God's people at a local church level in Jinja and also conducting similar training in Sudan. Joyce works as an administrative assistant to help sustain the daily needs of the family and also oversees all the women's and children's ministries at church. In addition to leading the church they are also involved in managing a micro-loan/food production scheme in Jinja to improve the socioeconomic position of the church members. 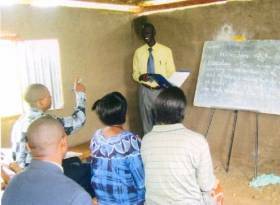 The church is made up of people who are victims of the war in northern Uganda and southern Sudan, squatters who face continuous displacement with nowhere to go, children from divorced parents and orphans, and widows/widowers so they consider it vital to have a holistic approach to their ministry. The Lubari family and the many people they minister to. The absolute commitment to the work in Jinja and New (south) Sudan. "I sometimes feel weighed down. You know I was an orphan and suffered that trauma right from childhood until when I started working to fund my schooling. My father died when I was eleven (my mother had already died when I was 2). I laboured from that age to the time I completed my A' level in 1983. Within which year I married after being employed with an Agricultural Development agency in Sudan." Thomas - part of his written story. As you read this you get an idea of the character of the man. Both he and Joyce are very hard workers. Thomas is away from home a lot as he tries to develop leaders in Sudan while his family is based in Uganda. Joyce works part time in the office of a Bible School to earn some extra money to care for the family while Thomas is away. It is a hard life, being separated for long periods. Thomas takes people with him from the church in Jinja on his visits to Sudan but it is very hard work in Sudan and few of them last the distance. Currently there are a number of new things on the agenda being developed. At the moment Thomas visits Sudan four times a year to train church leaders and to make contacts with the key people. There are plans developing for a school, a Bible school, agriculture training, church planting and micro-enterprise.